Dipping different sizes of pretzels in caramel results in slightly different tastes. 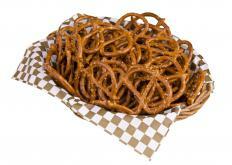 Caramel pretzels are pretzels that have a caramel flavoring. Most of these treats get their combined salty and sweet taste when pretzels are dipped in a caramel coating. They can be made from scratch or purchased from a retail outlet. When being made from scratch, the flavor of caramel pretzels can be enhanced by using different pretzel types and adding various ingredients. In general, pretzels are dough-based baked products. They typically have the vague shape of three loops, and they may be hard and crunchy or soft and bread-like. Salt is another main fixture of pretzel snacks. The salt specks are usually sprinkled over the finished product. Since caramel is one of cooking’s most popular flavorings, it serves as a sweet coating for everything from apples to ice cream. The sticky, semi-liquid substance results when sugar reaches temperatures of around 340 degrees Fahrenheit (about 170 degrees Celsius). Caramelized sugar has a light to dark brown color. Caramel pretzels continue a tradition of combining sweet and salty flavors. Many individuals find this combination pleasing, as evidenced by the popularity of caramel-covered popcorn. Such snacks were a fixture at fairs and carnivals before being moved into mass production for consumers. Several candy companies now offer caramel pretzels that may be pre-ordered for a gift or simply as a tasty purchase. Learning to make caramel pretzels could be an ideal option for beginner cooks. One may simply purchase premade caramel and heat it up. Once the pretzels have been dipped into the caramel, all that remains is to let the pretzels cool on a cookie sheet for around half an hour. Refrigeration may accelerate this process. In contrast, an individual may prefer to personally make the caramel. This is accomplished by boiling substances like white or brown sugar, condensed milk, and corn syrup together. For an even sweeter taste, many recipes supplement additional sweet flavors with the caramel. Caramel pretzels may contain a milk chocolate or white chocolate coating in additional to the caramel. Nuts or small candies are another favorite additive for these recipes. In addition, the snacks may come in various shapes and textures. Some prefer using thick pretzel sticks, whereas other cooks opt for the traditional twisted pretzel shape. Individuals could also use the large, thick soft pretzels that are made with yeast. Soft pretzels are available in many pastry shops, and these treats are often combined with sweets like caramel. One particular type has a substance called puff pastry as the base, and the bread may be sweetened with additives like sugar. Caramel may be basted over these pretzels, or even occasionally combined with the bread itself. Additional toppings such as sprinkles could put a last sweet flourish on the finished product. What Are the Best Tips for Making Caramel Apple Dipping Sauce? What are the Best Tips for Baking a Caramel Tart? What is a Chocolate Fondue Fountain? What Are Some Good Kids' Party Food Ideas?